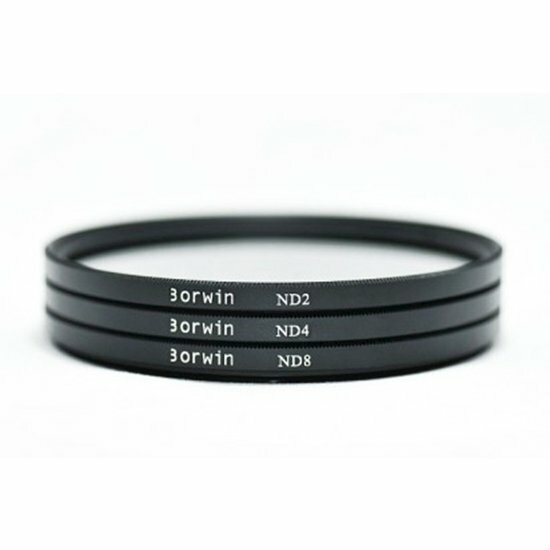 Borwin nd filter allows the photographer to utilize a larger aperture. Instead of reducing the aperture to limit light, the photographer can add a nd filter to limit light, and can then set the shutter speed according to the particular motion desired (Blur of water movement, for example) and the aperture set as needed (Small aperture for maximum sharpness or large aperture for narrow depth of field, human subject in focus and background pleasantly out of focus). Nd 2, nd 4, nd 8 filter reduces 1, 2, 3 stops of light respectively. In other words, the metering of a waterfall scene, say at f/22, 1/8 second, will allow you to use a slower shutter speed (1/4 second with nd 2, 1/2 second with nd 4, 1 second with nd 8) to achieve silky smooth waterfall. - blurring water motion (E.G. Waterfalls, rivers, oceans). - reducing depth of field in very bright light (E.G. Daylight). Example you want to take human portrait at the beach and want to choose a f/1.8 aperture for pleasant out of focus background. - when using a flash on a camera with a focal-plane shutter, exposure time is limited to the maximum speed -often 1/250th of a second, at best- at which the entire film or sensor is exposed to light at one instant. Without an nd filter this can result in the need to use f8 or higher.